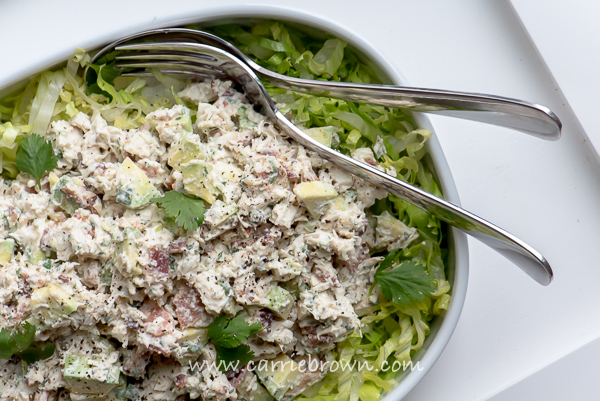 Who doesn’t love a great chicken salad? 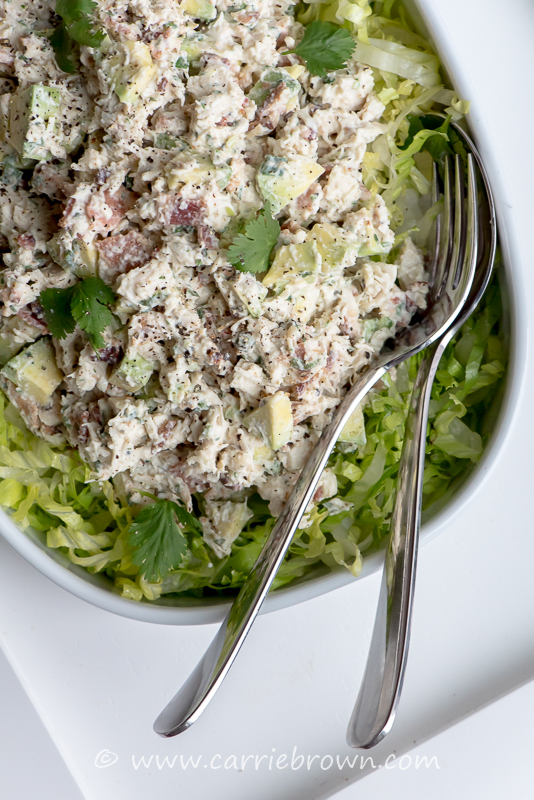 But you know what makes a great chicken salad even better? Avocado! And bacon! This scrumptious Chicken and Avocado Salad has them both, and it’s perfect for pretty much any meal and every occasion. Eat this Chicken and Avocado Salad with some fresh greens as a hearty dinner when you don’t need something warm. Pack it for lunch, or take it on a road trip – picnic food at it’s finest! Scoop some between two halves of a delicious KETO biscuit or two slices of KETO bread. Cram some into a cheese taco shell – with or without the lettuce – for a delightful cold lunch or dinner. No forks required. If you love chicken, this is a perfect recipe to up the fats and make it more KETO, since chicken is one of the leaner meats. 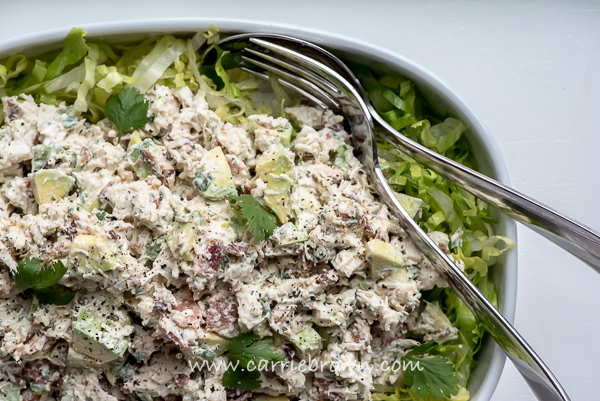 This delicious Chicken and Avocado Salad will take a little longer to prepare if you need to cook the chicken, but I often keep some Trader Joe’s ready-cooked shredded chicken in the fridge or freezer, for those days I have no time or inclination to get the oven hot. The bacon can cook quickly while you’re getting the rest of the salad together if you don’t keep a stash of cooked bacon in the fridge. Go on, make a big old batch and have a delicious meal ready in minutes! 2 avocado, cut lengthwise, stone removed, peeled, and cut into pieces. In a large bowl put the water, sour cream, cream, cilantro, sea salt and onions and mix well. Add the lime juice, cooked chicken, cooked bacon, and avocado and stir gently until everything is completely coated in cream mixture. Place the shredded lettuce on a plate and spoon the chicken avocado mixture on top. Keep your avocados on the counter until they are ripe, and then store then in the fridge to slow down further ripening. Buy pre-cooked chicken pieces to save time. Cook bacon in bulk so you always have some cooked bacon on hand to make quick recipes like this. For lots more great recipes check out our scrumptious cookbooks! Available in both print and digital versions. Check out the categories in the left side bar and the tags at the top of the post to help you find more recipes using certain ingredients or from certain categories. You can swap out the scallions with white or yellow onions that have been grated or very finely chopped if those are what you have on hand. The flavor will be different, but it will still work. You can swap out the lime juice for lemon juice, although the lime elevates the flavors more than the lemon, so I recommend lime if you have some. You can swap out the sour cream for Greek yogurt. The flavor will be different. You can swap out thick coconut milk (or coconut cream) for the heavy cream. The flavor will be different.